Select the Header drop-down menu. Once selected, scroll down to the bottom and click on Edit Header. Click the Right-Align button to right-justify your header text. Now you are ready to type in your header information, which we will discuss below. Also note that you may want to insert your page number first before entering any other information. Inserting a page number using the Insert Tab will hide any current information in your header. We discuss how to insert a page number later on in this blog article. The following are a few general guidelines for what you should have in your law school personal statement header. A title for your personal statement is unnecessary, as it is not a short story you would write for an English literature class. It is your personal story crafted specifically for law school, which happens to be in a narrative style. For this reason, refrain from including a pithy title even though it might feel so right. Your personal statement should contain your full legal name in the top-right-hand corner of each page. We suggest using the Last Name, First Name format, as it can make candidate identification easier when being reviewed by Law School Admission Committee Members. Cut or Copy this so that you can reinsert it once you have added page numbers to your header. 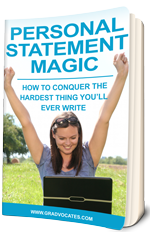 Typically, personal statements are limited to two pages. Some schools will allow for longer personal statements. As long as an application document is more than one page, page numbers should be used. Put your page number to the right of your name. Your entire header should be right-aligned. Because we read right-to-left and stapled documents are stapled in the upper left corner, we suggest right-aligned headers for easy visibility. If you have a long name or prefer your page numbers to appear somewhere else, you can place your page identifier in the center of your document footer. Select the Page Number drop-down menu. Click Top of Page. This should display various page number formats and alignments. As we previously mentioned, you may want to do this first before adding your name or any other information to your header as doing so will clear out this information anyway. Click on the right-aligned Plain Number 3 option. This should insert a page number on all pages of your document using your standard document font. Typically, Times New Roman font should be used for writing your personal statement. Change your header and page number font to Times New Roman if they are not already. You can paste your full name as described in the previous section back into your header at this point. Leave a space between the page number and your name. Use the line below your name in your header to include your LSAC number. You will most likely submit your document through the LSAC website. As mentioned here: http://www.lsac.org/jd/apply/lsac-account-number.asp, the LSAC prefers that your LSAC account number appear on all documents and correspondence with them and in your application. Many schools like to see applicants’ LSAC numbers on documents for easy candidate identification as well. You may be submitting several essays, a resume or CV, along with other documents in your application. We suggest indicating the type of document (Personal Statement) in your header under your LSAC number if you have room. If running short on room in your document, this part of the header can be eliminated to save space for more important story content. For information on overall personal statement formatting, see our Guide to Law School Personal Statement Formatting. Also, be sure to check with each school’s respective website and application instructions on the LSAC’s Credential Assembly Service for specific details on document formatting requirements. The LSAC website should be the most up-to-date resource for each school’s application instructions. If there happens to be a discrepancy between the application instructions on the school’s website and www.lsac.org, contact the school’s admissions department to clarify before submitting your application. We make sure you have a proper header when we analyze and thoroughly review your personal statement document. Click here for more information on our law school personal statement editing service, and check out the rest of our blog for helpful tips and interesting stories. If you need assistance with making any of your other law school application documents the best they can be, check out our law school application document editing service or contact us if the document you need help with is not listed on our website. We hope this article was helpful. Please share your comments with us below.